The 18th-century poet and artist William Blake once wrote, "Art is the Tree of Life. Science is the Tree of Death." Blake was a controversial figure who rejected organised religion, but in his art and writing he yearned to find a sense of wonder in the world that science was increasingly defining and exploiting for profit around him. Even as she proves his statement too simplistic for the 21st century, echoes of Blake’s sentiment can be found in Bjork’s multidisciplinary approach to ’Biophilia’. Existing as iPad apps and a traditional record, it represents her refusal to accept barriers between scientific rationalism and the marvel of the natural world, between different creative disciplines - the expressiveness of music versus the strict language of coding. By turning hours of research on DNA (’Hollow’), lunar cycles (’Moon’) and gravity (’Solstice’) into sublime music, and having the grace to allow this to be shaped by the leading lights in application design, Bjork has created one of the boldest artistic statements of our time. Yet after the excited reception granted to the tech side of ’Biophilia’, could releasing its music as a mere album seem rather arcane ? Well, no. Science and education are at their most easily digestible when given with a sweetener. As you hear the choir, the complex Tesla synth, pendulum harps, gameleste, harpsichord and of course Bjork’s voice and words, she creates a gift for your imagination, a tool more powerful than any iPad. of cosmology to the microscopic formation of crystals and the way a virus spreads, musically the joy here is m simplicity. These songs were all written upstairs in a small room in Bjork’s house in Reykjavik before being developed in a beach hut in Puerto Rico. 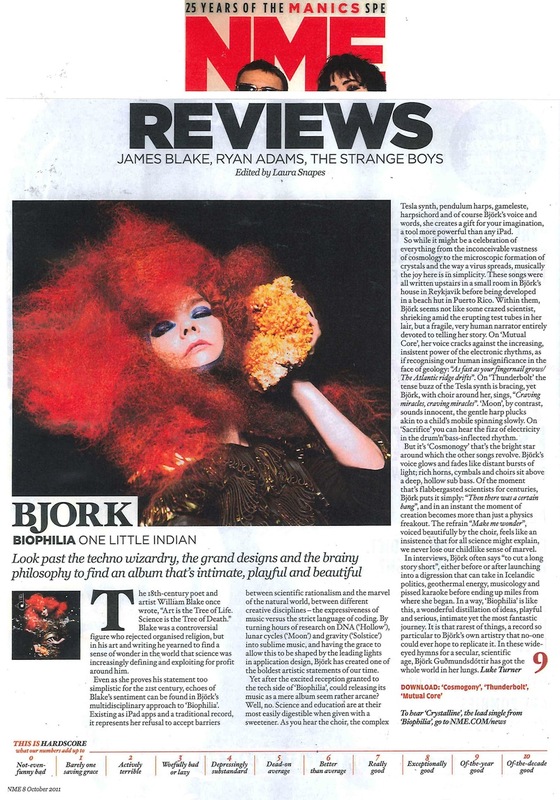 Within them, Bjork seems not like some crazed scientist, shrieking amid the erupting test tubes in her lair, but a fragile, very human narrator entirely devoted to telling her story. On ’Mutual Core’, her voice cracks against the increasing, insistent power of the electronic rhythms, as if recognising our human insignificance in the face of geology : "As fast as your fingernail grows / The Atlantic ridge drifts". On ’Thunderbolt’ the tense buzz of the Tesla synth is bracing, yet Bjork, with choir around her, sings, "Craving miracles, craving miracles". ’Moon’, by contrast, sounds innocent, the gentle harp plucks akin to a child’s mobile spinning slowly. On ’Sacrifice’ you can hear the fizz of electricity in the drum’n’bass-inflected rhythm. But it’s ’Cosmonogy’ that’s the bright star around which the other songs revolve. Bjork’s voice glows and fades like distant bursts of light ; rich horns, cymbals and choirs sit above a deep, hollow sub bass. Of the moment that’s flabbergasted scientists for centuries, Bjork puts it simply : "Then there was a certain bang", and in an instant the moment of creation becomes more than just a physics freakout. The refrain "Make me wonder", voiced beautifully by the choir, feels like an insistence that for all science might explain, we never lose our childlike sense of marvel.